The boy looked as if he would do exactly what he said. There was an unmistakable resolve and determination in the way in which he spoke. The head master was graceful enough to admit the boy in the sixth standard of his school, little knowing he was accommodating a person who was destined to make history. That was Karunanidhi. He was a fighter even before he would come into contact with politics. He was born in a community which had been oppressed, exploited, humiliated and derided for centuries. They had no right even to stand erect. Some of them were musicians of world renown. But they had no right to wear a shoulder cloth, while performing in front of the higher echelons of the society. It was therefore possible the boy was deeply hurt by something he had seen or heard and he was filled with a determination to fight out the inequity. It so happened, that Kalaignar’s birth almost coincided with the founding of Self Respect Movement which by its very nature attracted the lad. Kalaignar would say later that if he had not been attracted by the Movement, he would have joined the Communist Party, another party of warriors determined to fight for the poor and the downtrodden. A part of the DMK’s three pronged agitation of 1953 was Kallakudi agitation launched for changing the name of Dalmiapuram Railway Station in Trichy district into Kallakudi since the name as it stood was considered an affront on the prestige the Dravidians. Kalaignar Karunanidhi, the youngest among the party stalwarts, was chosen to lead the agitation. As it was, he had to proceed to the station with volunteers, sticks posters with the intended name of the existing name-board and stage a demonstration at the station. But this was not sufficient for the impetuous Karunanidhi, who led by his impulse, lay down on the railway track blocking the movement of a train which was about to start. He was forcefully taken away to prison. He is remembered till today for this singular act of bravery. Karunanidhi’s opposition to Hindi is well known, which came into the open when he was still a school boy at Tiruvaroor, and marched a band of student volunteers on the roads carrying a flag and singing his own songs, during the first anti-Hindi agitation in 1938. When the anti Hindi agitation was organised by the Dravida Munnetra Kazhagam in 1963, Kalaignar Karunanidhi was nominated to lead it and was presented with a silver sword. The struggle against Hindi went on relentlessly in Tamil Nadu until a constitutional amendment was wrested from the Centre. Though, many valiant leaders of the Dravida Munnetra Kazhagam took active part in the agitation Kalaignar was singled out for solitary confinement in Palayamkottai prison, a testimony to the foremost part he played in it. After he took over as Chief Minister after Anna’s demise, he faced the first election as the leader of the party in 1971. The election was his own making as he prematurely dismissed the assembly to fight for the election along with Indira Gandhi who had called for elections one year before its term was over. Kalaignar faced formidable opposition by the Congress (0) – Swatantra combine, who were prepared to go to any length to unseat the Dravida Munnetra Kazhagam, hurling abuses without any basis, and without any rhyme or reason. It was made out that the Dravida Munnetra Kazhagam rule was a freak occurrence and would be rooted out as people had realized that they had elected it by mistake. 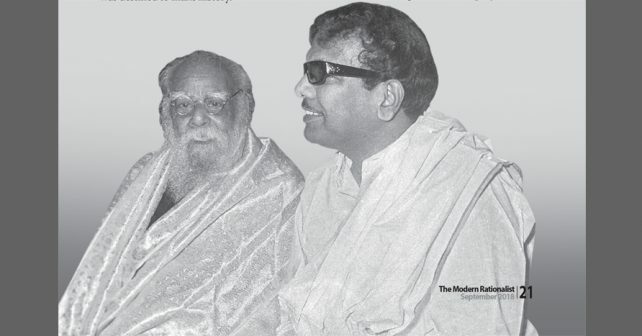 A stray incident that happened in the Salem Conference led by Periyar was magnified manifold accompanied by a slur campaign. In the election propaganda, that touched its nadir, even Kalaignar’s eye sight, projected as failing, became an election issue. The next challenge met by Kalaignar Karunanidhi was from within its party, when the treasurer of the party, M.G.Ramachandran (popularly known as M.G.R.) started accusing Kalaignar and other MLA’s of corruption, in the most generalized manner, without making any specific charges. Eventually, he was joined by parties in the opposition. When the Chief Minister dared him to make specific allegations, he refused to do so, but gave a memorandum to Indira Gandhi and Indira Gandhi forwarded it to Kalaignar, who made it public in the Legislative Assembly along with his replies to the charges. Thus, the Assembly witnessed a paradox of the prosecutor refusing to reveal his charges while the accused person making them public. The murky designs of the detractors of the Dravida Munnetra Kazhagam who egged on MGR did not succeed in destabilizing the government, the DMK being in tact, though the mass base was taken away by MGR who formed the next Government after defeating the DMK in the elections that followed. 1975 can be called the darkest year in independent India as it witnessed the clamping of Emergency by Prime Minister Indira Gandhi, It was followed by the abrogation of the rule of law, censorship of the press and obliteration of freedom of speech. Kalaignar, though he had staunchly supported her in all her progressive measures till then and helped her in strengthening her position in the Government, withdrew his support for her when she started moving in the dictatorial path. A committed supporter of democracy, he went to the extent of passing a resolution in the Legislative Assembly condemning the Emergency, not to speak of a lengthy resolution passed by the General Council of the Dravida Munnetra Kazhagam. He made us of every occasion to enlighten the people as to how unjust, autocratic, irrational and anarchical the move was. Kalaignar ingeniously devised means for communicating with his cadre through figures of speech and innuendoes in his ‘Murasoli’ daily, hoodwinking the ever-vigilant censor. How Karunanidhi overcame press censorship and communicated with the cadre was a saga in itself. Many of his fellow leaders having deserted him, and a few of them standing in the sidelines, he was left to take on Indira Gandhi’s government single handedly, which he did without the slightest hesitation. When his article on Anna was censored without any rhyme or reason, he was no more prepared to take things lying down. He went to Anna statue with hand-made pamphlets and distributed them to the public, all the while shouting slogans against Indira Gandhi’s dictatorship. He was arrested, but was released in the afternoon. Again, in the early morning of his birthday on 3rd June 1976, when police resorted to indiscriminate beating of those who had gathered in front of his house, Kalaignar announced through the microphone that he would stage a march towards Fort St. George along with his followers and dared the police to shoot or beat them. That made the police relent and come out with an assurance that no harm would be done to the party-men. There was a talk, in usually reliable quarters, that Indira Gandhi was contemplating banning of regional parties. Without the slightest hesitation M.G.R. prefixed the phrase, ‘All India’ before the name of the party, calling it All India Anna Dravida Munnetra Kazhagam, and converting it into an All India party in a jiffy. But Kalaignar would not think of any such move to protect his party, as he considered Dravida Munnetra Kazhagam as a party of the state, fighting for its autonomy. A significant factor in Kalaignar Karunanidhi’s political career was the unabashed vilification he had been put to. It looked as if any blame would stick on Kalaignar and he could be blamed for anything he did, good or bad. When he demanded state autonomy, it was construed as a veiled attempt at separatism. When he was asked why he had to demand state autonomy and not just devolution of powers, his reply was pertinent. When we ask for devolution of powers we are asking for a concession, but when we demand autonomy we are demanding our rights. When he suggested a ‘standard’ for the state (mind you, he was being extra cautious, he never used the word ‘flag’) the use of which could be limited for some purposes, there was so much of hue and cry from all quarters. Now, about forty years later, people are coming round to the idea of states having their own flags. The report of the Rajamannar Committee appointed by Chief Minister Kalaignar to examine the subject of state autonomy and come out with suitable suggestions including contemplated constitutional amendments did not receive the attention it deserved. When MGR was going ahead with his avowed slandering campaign in the legislative assembly and outside it, a simultaneously whispering campaign, was going on as to the imaginary corruption practices he indulged in. They simply showed a cinema hall or a mansion or a hotel and whispered that Karunanidhi had purchased it. As their campaign went on with Goebbelsian intensity and regularity, many people started wondering whether there could not be a bit of truth in these rumours. Indira Gandhi, on her part, in order to justify the uncalled for dismissal of Kalaignar’s Government, appointed Sarkaria Commision to go into the so called misdeeds of the DMK Government. But the exercise, however, proved to be a waste of time and effort, no more than tilting at windmills. Curiously, Kalaignar fought the final battle hours after he breathed his last, and came out successful, when he had to fight a legal battle for his final resting place. Having worsted his misinformed and misguided opponents, he made his journey which turned out to be a triumphant march towards his mentor’s abode.